Halifax prop Luke Ambler will get his first taste of a league derby against Bradford when the sides go head to head for the first time in more than a decade at Odsal on Good Friday (8.0). Ambler, an Ovenden junior, was barely into his teens the last time the sides met in Fax’s disastrous 2003 relegation season. “It’s a massive game; they’re the games I watched when I was growing up, the games my dad used to talk about when I was a kid,” said Ambler. “It’s all been about the Leeds/Bradford derby for the last few years, but the Bradford/Halifax games used to be the big games over Easter. “I was only 12 or 13 the last time we played them and I don’t think I realised how much people from Halifax dislike Bradford. “People have been talking to me about the game this week and I met one guy who says he won’t be going because he hates Bradford that much; he doesn’t want to give them his money. “That shows how important it is to the fans. 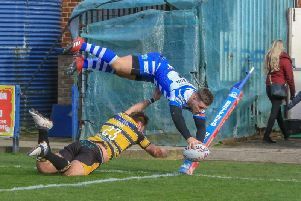 Fax lost 22-18 in London last weekend, although Ambler said he was still in “disbelief” at their failure to leave Barnet with two league points. “It was a weird game; it felt like it was a dominant performance in lots of ways, we just didn’t manage to put them away when we had the chance,” he said. “It was frustrating, our game management let us down a little bit and we maybe pushed the pass a little bit too much in the wrong areas. “But if we keep going through the same processes, the results will come. Friday’s game will bring Fax’s players back in contact with the man who signed most of them, the club’s former coach Karl Harrison, who is now assistant to Bulls boss James Lowes. Harrison has declared himself off limits to the media this week, but Ambler says he has nothing but respect for the man whose efforts in the Fax front row earned him a place in the club’s Hall of Fame. “I have got a lot of time for Karl, both for bringing me to the club and for what he did for me when he was here,” said Ambler. “I probably needed a kick up the backside last year and he gave it to me, which I’m grateful for.